The most favorite product shoplifters named cheese, reports Huffington Post . According to Lenta.ru , the conclusion made ​​by experts of the British Center for Study of retailers who have analyzed the results of nearly two thousand retailers in 43 countries. Read: The thieves attacked the house of the president edition of "News"
It was found that more than 3 percent of the cheese incident on the counters, is stolen. According to Director of Research Center Bemfilda Joshua, a target for thieves due to the cheese-growing product prices. He noted that the theft of the product often do not happen spontaneously, and are planned character. Stolen usually resold to other shops or restaurants. In addition, a list of favorite foods include meat thieves, chocolate, alcohol, seafood, and baby food. Recall that one of the most exciting cheese theft occurred in the U.S. several years ago. 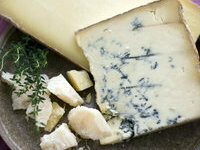 In Oregon, the two women was carried out of the store, "Gaudi" and blue cheese for 570 dollars. Meanwhile, writes "Khakassia-Inform" , October 22 from the car body in Abakan was stolen cheese in the amount of six thousand rubles. As stated in the local police department, the car from which the product was lost, was parked on North Market. Unknown broke the Chinese castle, climbed into the truck and stole.